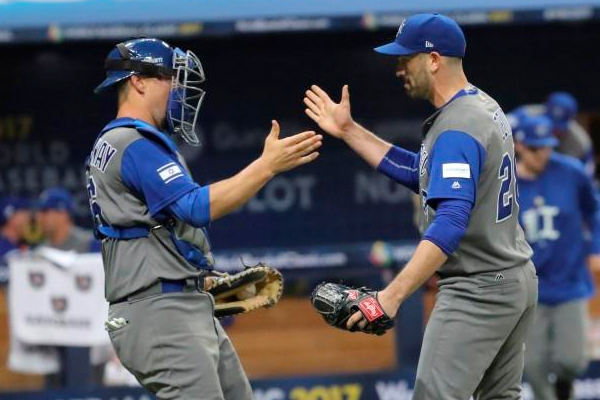 Israel entered the World Baseball Classic without a single major leaguer on its roster and the steepest odds to win the tournament, but none of that mattered Monday morning as the club defeated South Korea, 2-1, in an extra innings affair in Seoul to open the 2017 edition. Though low-scoring, both teams had plenty of opportunities to put runs on the board. Israel jumped ahead in the second inning, loading the bases via a pair of walks and a double before pushing across the game’s first run on a walk by Indians farmhand Tyler Krieger. Korea then tied the contest in the fifth, putting two men on vase before Geonchang Seo clipped a one-out RBI single to left. In the eighth, Israel loaded the bases before Cardinals closer Seung-hwan Oh came on to strikeout Scott Burcham to escape a jam. Korea had an opportunity in the ninth to put the game away with Yongkyu Lee drawing a two-out walk, but he was gunned down by Ryan Lavarnway trying to advance on a stolen base. Having thrown 20 pitches, Oh was replaced by Chang-Yong Lim to open the 10th inning. Ike Davis then eached on a one-out walk and scampered to third on a Lavarnway single to right-center. Krieger followed with a failed bunt attempt but Burcham came through this time with an infield single that scored pinch-runner Mike Meyers from third. Reliever Josh Zeid retired Korea in-order in the bottom of the frame, striking out former Mariners slugger Dae-ho Lee to secure the victory. With the win, Israel sits at the top of Pool A and has a legitimate chance to move to the second round if it can secure a victory against either Chinese Taipei or the Netherlands. Sam Fuld collected a pair of hits in the winning effort for Israel while Jason Marquis tossed three scoreless innings and whiffed three. Zeid notched the victory and threw 49 pitches, narrowly avoiding a 50th pitch that would have forced him to miss the next four games of the tournament. Israel: With their first ever WBC win in tow, Israel faces Chinese Taipei on Monday night (Tuesday in Seoul). A win would put the Israelis in a strong position to advance to the next round. Korea: The Koreans are in a tough spot, likely needing to secure wins against the Netherlands and Chinese Taipei to move to the second round of the tournament.